The LiftMeUp is a portable electric recliner designed to outfit your bed and make it adjustable. From laying down to sitting upright, find your optimal position at the simple touch of a button. The LiftMeUp recliner is the most comfortable and convenient way to read, watch TV, or sleep at an incline. Instantly upgrade your own bed for a fraction of the cost of an electric bed! The LiftMeUp recliner is easy to install and arrives fully assembled. Have your new portable, electric bed set up within minutes - no tools required! Plug into the wall. Your LiftMeUp recliner is ready to use! "What a gift the LiftMeUp was to me when I returned to my own bed after surgery! Without it, I would have slept in a chair. I was able to independently get myself in and out of bed. It provided me assistance that helped me keep my dignity and independence at a vulnerable time in my life. It is simply the best piece of equipment out there!!! I would recommend this product to anyone who might need assistance getting in and out of bed or anyone who needs to sleep at an incline.It's absolutely the best!" 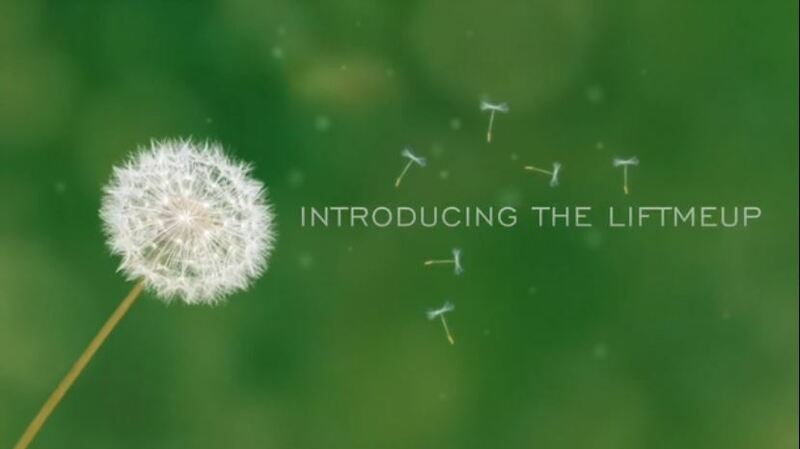 "I used the LiftMeUp when I got home from my abdominal surgery. It was really helpful in managing my pain by providing me with multiple position options and regain my mobility and independence more quickly. My wife appreciated not having to manage my every movement as I could do it for myself again." "Thank you Abely for creating such a simple and brilliant idea, the LiftMeUp really helped me after my surgery. It's extremely comfortable and I love that it's portable and can be moved from the bed to the couch." "My husband suffered a bad fall from a height, resulting in six broken ribs in multiple places and a punctured lung. After 2 surgeries and 5 days in the hospital, he was sent home with no help or instructions on how I should care for him. The simple things alone, like getting him in and out of bed, seemed almost an impossible idea! Luckily, I had heard of the LiftMeUp recliner through a friend, it was a game changer! It enabled my husband to sleep at an incline (he was not allowed to lie flat for the first few weeks), easily adjust his position and sit up in bed on his own. It allowed me to get him out of bed with no stress on my back and, with time, it gave him the freedom to get out of bed by himself - much sooner than he would have been able to without the LiftMeUp. I can’t tell you how much that little bit of normality lightened his spirit! We even took the LiftMeUp recliner with us when we traveled to London for a very important business meeting so my husband could have the help he needed there. I would highly recommend the LiftMeUp to any caregivers to avoid injuries to their back as well as to anyone who had thoracic or abdominal surgery during their recovery at home." "One of the thoughts that gave me anxiety leading up to my major surgery was “How will I sleep as I’m in recovery”? The LiftMeUp gave me the ability to do that and feel closer to being myself again. It fit beautifully over my pillow topped queen sized mattress and I was able to sleep between my own comfortable sheets. 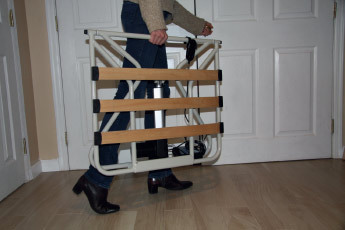 The LiftMeUp was especially invaluable for those middle of the night bathroom trips with its motorized lift. As a single woman with no one to assist me, the LiftMeUp gave me just the help I needed when I needed it the most! " "I have a chronic condition that requires me to sleep at an incline. Being able to adjust my position as needed throughout the night has made such a difference in my quality of life. The LiftMeUp recliner has been a game changer! I take it with me wherever I sleep." "The LiftMeUp recliner helped me so much when I returned home from the hospital after my major surgery. I could not believe that the recliner actually enabled me to get out of bed without any help. When I was in the hospital, whenever I had to get out of bed, I needed assistance from the nurses. The recliner attached to my own bed was very easy to adjust and very comfortable. I’ve been telling everyone about it and I recommend it to anyone who needs help after surgery. No need for a hospital bed!" "Using the LiftMeUp made a massive difference both while on bedrest before delivery and after my C-section. 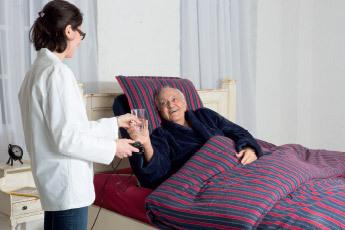 While on bedrest, I could easily and comfortably keep myself situated. Postpartum, the LiftMeUp was essential when getting up out of bed for constant feedings and nighttime comforting. I believe my recovery time was dramatically shortened through my use of the LiftMeUp. I think the recliner allowed me to rest when I needed to and avoid straining my abdominal and pelvic floor muscles that were just starting to mend. I would highly recommend the LiftMeUp to all new moms, anyone on bedrest, and anyone recovering from abdominal or back surgery. I am so thankful to have the help when I needed it and have a pleasant experience while on bedrest and postpartum with the LiftMeUp." "I was introduced to the LiftMeUp recliner prior to my bilateral mastectomy with DIEP Flap reconstruction (long for a tummy tuck). I chose this method because it allowed me to use my own tissue. I contacted Abely to learn more about the LiftMeUp recliner and was extremely pleased to hear all the comfortable uses this product offers. The ability to simply get into bed, be easily lowered and, when ready, to get back up is amazing. I truly believe the LiftMeUp helped shorten my recovery by limiting the amount of pain I would have had getting up and down and out of bed. I highly recommend this product!" "The LiftMeUp recliner was a life saver after my double mastectomy with DIEP flap reconstruction and helped me sleep comfortably in a reclined position in my own bed, which would have been difficult to achieve without it. It was a great transition from a hospital bed to my own bed without having to sacrifice the comfort. The electric remote control helped me adjust the position and make it easier for me to get up. I would highly recommend the LiftMeUp recliner to anyone who has had a surgery or struggles with getting out of bed." "I love my LiftMeUp recliner! I no longer need help to get in and out of bed. After trying everything to sleep at an incline, I can now recline to an optimal position instead of using a bulky wedge or a stack of pillows like I used to. What an upgrade, and without changing my bed!" "After my 88-year-old mother fractured her back in a fall, the doctor recommended bed rest and a hospital bed. The logistics of renting a hospital bed and storing her regular bed, or buying one and giving up the luxury of a queen-sized bed she enjoys were overwhelming. Then I saw the LiftMeUp. It was exactly what we needed—all the perks of a hospital bed without having to change everything. 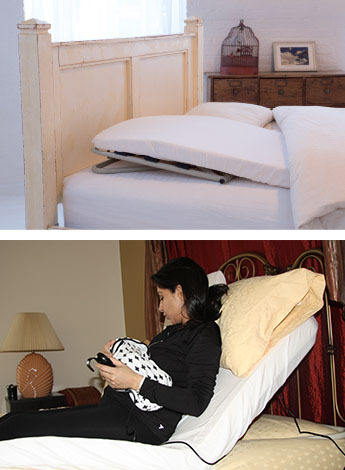 It was easy to install right over Mom's mattress, easy to use even for someone like Mom who has some level of cognitive loss, she finds it very comfortable, and being able to raise the upper body means she can sit up to eat, read, or watch TV, and makes getting in and out of bed much less painful. The LiftMeUp has made her recovery time much more comfortable, and eliminated any extra strain on her back from trying to sit up on her own." "After my surgery, the LiftMeUp was such a relief. I could sit up with barely any pain. I would recommend it to anyone post surgery, but also for reclining comfortably in bed. " "My name is Therese, I am 31, and was diagnosed with breast cancer in August of 2018. My doctors wanted me to have chemotherapy over 18 weeks prior to surgery. I had the anticipation and stress of waiting for surgery for months not knowing what to expect and how I would feel. My friend, a survivor, suggested I use the LiftMeUp recliner for recovery and that it would help me. Boy, was she right! I have a high bed so I used a step stool to get on the bed where my husband set up the lift. I was able to relax, sleep and recover comfortably without having to use my core muscles to lay down and get up. It was incredibly helpful and made recovering easier. It was so easy to use the control to adjust my position. I highly recommend this product!" "I was truly lucky to have the LiftMeUp after my surgery. It was so easy to install and use and allowed me to be self-sufficient and mobile during the most difficult time in my recovery. Amazing product!" "I learned about the LiftMeUp prior to my bilateral mastectomy with DIEP flap reconstruction surgery. After some research, I decided to give it a try. I am so glad I did! The LiftMeUp recliner provided me the comfort of up and down with just the push of a button. It was extremely helpful. I was able to get out of bed by myself with limited pain post my surgery. I highly recommend this product for anyone who had a surgery or need help getting out of bed." "I am a nurse and used the LiftMeUp recliner after my hysterectomy. It was a complete life saver! It’s unobtrusive and very comfortable, it’s simply a gift to anyone who would need it, especially for a person living alone. Knowing you can be comfortable and also move around and not hurt yourself takes a tremendous load off what could be worries of healing. The LiftMeUp recliner is AMAZING. I’ve been telling my healthcare providers about it, as well as my nurse and physician friends. Many patients could heal better with the help of the LiftMeUp, including all postpartum c-section moms. I’m very thankful for this product!" The LiftMeUp electric recliner is fully portable and can be used around the home and when traveling, for a weekend or on an extended vacation. Weighing only 21 lbs and with a minimalist design, the LiftMeUp is the perfect solution to your all your reclining needs. The LiftMeUp is a portable recliner that can be operated by the user or by a caregiver. Easy-to-push buttons on the handset are easily activated, even by arthritic hands. By providing assistance in transitioning between positions (sitting, reclining, laying), the LiftMeUp recliner helps address the concern of caregiver safety. The LiftMeUp recliner empowers users with limited mobility or low upper body strength by allowing them to independently adjust their position from lying to sitting in bed (and vice versa) at the touch of a button. In its fully raised position, the LiftMeUp recliner also provides the support to help transition to or from a vertical position with limited efforts. Click here to learn more about getting in and out of bed using the LiftMeUp. 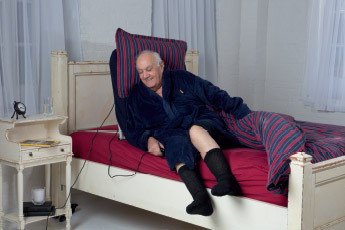 The LiftMeUp recliner also allows users to sleep in their own bed, next to their significant other, addressing the dignity issue that hospital beds deprive them from. The LiftMeUp recliner allows you to sleep with your head and chest slightly elevated, coming with a handset that gives you full control to adjust the incline exactly as needed. The LiftMeUp recliner can also be positioned at the foot of the bed to elevate your legs.